For as long as Bill Miller can remember, he has had his best friend at his side, something Joyce Miller can also proudly boast. 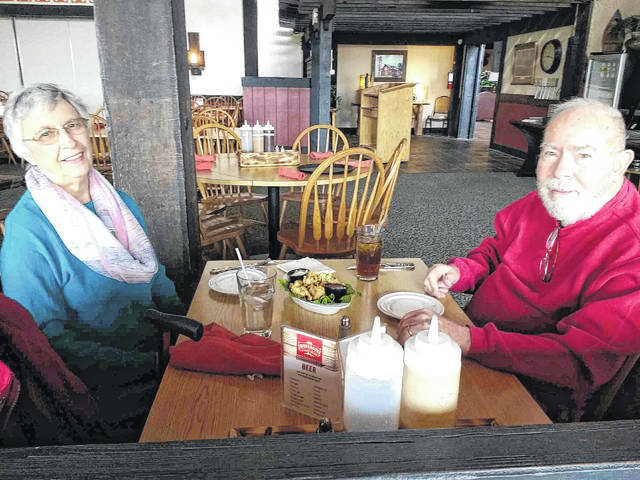 The couple recently celebrated 61 years of marriage together at Shawnee Lodge, over a familiar dish of oysters, where they recalled the secret wedding that started a family over six-decades ago. Now in their eighties, the two have many years under their belts, having fallen in love very early in life. In fact, the story of the Miller Family began in the 1950’s, when the two were each other’s high school sweet hearts, when they walked the halls of Portsmouth High School. After graduating, Bill enlisted in the United States Army and spent 3 years in Germany. Bill says he enjoyed serving his country, but looked forward to the rare correspondence from his lady back home. At one point, close to the end of his deployment, he returned home for a few weeks to visit with friends and family. It was a holiday season and he was ecstatic to be reunited with Joyce. In fact, he took this time to formally propose marriage, which she accepted. The two parted ways once again for him to complete his deployment. They said the time apart was very hard, but they worked hard and kept busy to make the time pass. Upon returning to the love of his life, he was happy to find her working hard to complete an extensive nursing program. Not wanting to wait, being eager to start living the American dream he fought for, Bill said he asked about their wedding. He said he was excited to marry the young nurse-in-training who had his heart for so long, but, there was a problem— The nursing program Joyce was in wouldn’t allow her to marry while she was in training. The two discussed their possible life together and couldn’t stand the thought of putting off their wedding. They had waited long enough. Unbeknownst to everyone, but two dear friends of Joyce, they planned to run away and get eloped. With a formal dance approaching, Joyce used the event as a cover for making her own dress to marry in. With the help of the aforementioned friends, Joyce made her dress by hand and they were off to Indiana to marry. The two eloped and came back to Cincinnati to stay the night. When they awoke the following morning to share their first breakfast as husband and wife, Bill realized that food options were slim. The only real option the young groom had was a very limited hotel kitchen menu. Since that secret wedding and unique breakfast in February of 1957, the two celebrate their romance with oysters. Following their return home, the Millers kept their secret to themselves before telling family in April. While they told close family in April, they continued to keep their secret from the public, until Joyce finished her program the following September. As soon as she completed the nursing program, she took her certification and they were off once more. Bill received a job in Huntington, WV, at Saint Mary’s Hospital, where he worked as the financial director. In a strange turn of events, Bill said he was able to thank the man who married him and his wife back in 1957. Joyce said the two started to have children around the time Bill’s job in Huntington was coming to an end, so they moved back to Portsmouth. The two said they were happy to be home, where they raised five children, made many memories, and always had each other to lean on. Bill would eventually retire after working in steel and Joyce nursed until seven years ago. When asked about their marriage, and what they attribute to their many years of success, they both answered differently at the same time. At the time Bill was attributing their success to Joyce’s stubbornness to make it work, she was answering that it was his sense of humor, which celebrated the good and got them through the bad. One thing they agree on, however, is that they love being with each other. “The best thing about all these years is just being married to her,” Bill said about a life spent with his wife. Joyce said that they have had their fair share of struggles, from losing a grandchild and great-grandchild to the common everyday struggles nearly everyone faces, but they’ve always supported the other and sought strength from God. One key rule that they follow is to be accepting and to never be mad at each other at the same time. Another secret the two shared was the importance of knowing when to drop everything and get away. The two were happy to go to the Shawnee State Lodge for their anniversary lunch, because they’ve spent many there. They’ve actually spent a lot of time at the local attraction when they simply needed time alone and a break from everyday life. They nearly didn’t make it out to the Lodge this year, however. They actually almost missed the tradition completely. When Joyce called local restaurants prior to their anniversary, she couldn’t find one that served oysters. She was about to give up, when her youngest son called the lodge and reached manager Robin McIntire. Moved by their story, McIntire made sure their tradition continued. She went to the grocery store herself to buy what was needed for the meal and the Millers were welcomed to enjoy their annual meal of oysters, as well as dessert, complimentary of Shawnee Lodge. McIntire said that she was more than happy to help the couple celebrate, because it felt like the right thing to do. “Shawnee Lodge is happy to be a small part of their 61 years of memories. Listening to their story and seeing their love for each other is such an inspiration to all of us,” McIntire said. The manager also said that stories like the Millers always pull on heart strings, because she understands the strength it takes to make a relationship last the years, as well as the wonders that come with it. So, while many will be celebrating this month of Hallmark cards and love proclamations with chocolates and roses, the Millers are glad to have their treasured trend of oysters to celebrate a secret runaway marriage that has lasted over six decades and served as the foundation of a loving home where they raised five children and made a lifetime of memories.